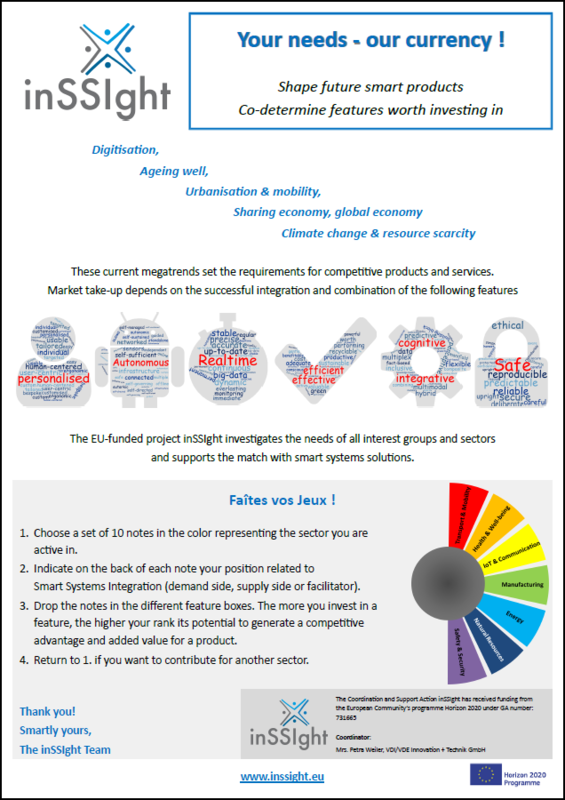 In the framework of the EU-funded project inSSIght, a survey in form of an investment game has been developed with the aim to identify the main “features” that products and services in 7 sectors shall integrate in order to respond to future challenges and megatrends. inSSIght helps R&D teams to shape future smart products and to co-determe which features and properties are worth investing in! In order to investigate the needs of all interest groups and sectors, and to support the match with solutions based on smart systems, an investment game has been developed. Each “player” choses a sector from the colour-coded list below and makes investments in the following features which he/she considers as bringing high added value and competitive advantages to future products.